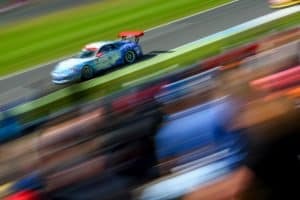 Silverstone, the home of British motorsport, will host rounds 12 & 13 of the Porsche Carrera Cup GB this weekend in what is set to be a spectacular two races. With only four races left of the 2017 campaign the three class championships are all getting very close, so the penultimate race weekend could prove pivotal. With the short National circuit always proving eventful racing both David Fairbrother and team-mate Ross Wylie could move up in their respective championships. David led the ProAm2 championship earlier in the year but a disastrous Oulton Park event resulted in two non-points finishes after he got caught up in someone else’s accident, relegating him down the order. Ross meanwhile will be looking for a solid weekend after being forced onto the grass, and out of the second race at Knockhill. The 6-turn, 1.6-mile National circuit features the fast, sweeping Copse and Maggotts corners as well as the technically demanding complex of corners including Brooklands and Luffield. These are linked by three fast straights, which is why the racing is always close – sometimes too close! Both drivers took part in the Championship’s group test on Tuesday so their Pall-Ex/Fuel Card Services branded 991 GT3 Cup cars will be well prepared for the two free practice sessions on Friday. The first takes place at 9am, with the second session following at 13:30. Qualifying will be at 13:25 on Saturday with the first race on Sunday morning at 9:40. The second race will be televised live on ITV4 at 15:15.